Colin Duriez has created "The A-Z of C.S. Lewis: an encyclopedia of his life, thought and writings," and this is a must-have for anyone whom is a fan of C.S. Lewis. This book is an amazing collection of C.S. Lewis' work that has been enjoyed for so many years. People and places from C.S. Lewis' life and his books are explained in this collection and it is a fascinating escape into his world. This is a wonderful, hardcover edition that will be treasured by each and every fan of C.S. Lewis. To read other reviews of this book, go here! 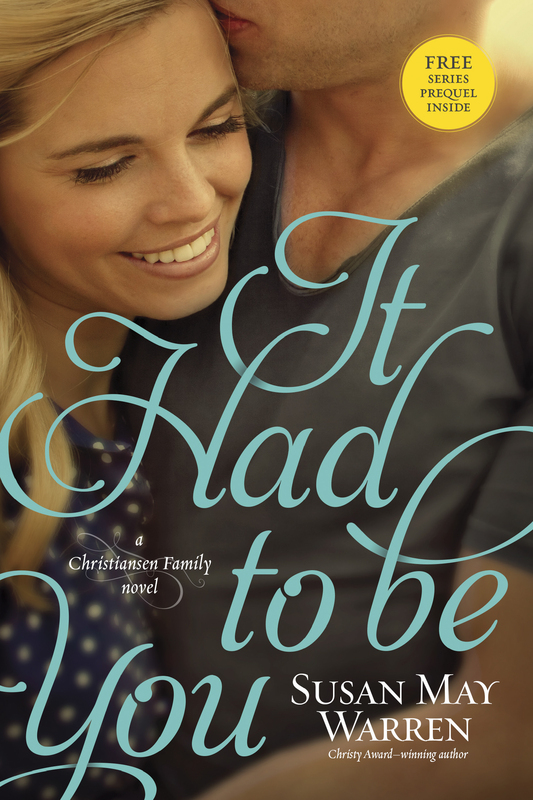 "It Had to be You," book 2 in Susan May Warren's series about the Christiansen Family and I loved it just as much as the first one! Eden feels like she does not matter, her life and what she has been doing does not matter, because she is stuck in a job that is not what she really wants to do and her life has been revolving around looking out for her brother Owen. Owen has made it to the big time as he is a NHL rookie; however he is also on a course that could potentially destroy his career. As Eden spends more time with Jace whom she thinks should be keeping a better handle on Owen, Eden realizes that she may have misjudged him. I loved this book and loved spending time with the Christiansen family again. Susan does an incredible job with bringing to life this family and their relationships among each other. Although the focus of this book is mainly on Eden, the other family members all play roles and I loved reading more about them and I am looking forward to Grace's story that will be released in a few months! Melody Carlson's latest teen fiction novel, "My Amish Boyfriend," is one that teens and adults alike will love! Shannon is the typical English teenager, her plans for the summer include getting her driver's license, a job and getting a tattoo. However, her plans are turned upside down when she arrives home to find out plans have been made for her and her ill mother to go stay with estranged family members whom live in an Amish community. Shannon cannot believe this turn of events; however she seems to have another change of heart is when Shannon meets Ezra and spends more time with him. What is Shannon going to choose as she is at a time in her life of great decisions and a time that will impact her future. I really enjoyed this book and it puts a little bit extra spin and adds extra challenges and choices to a typically confusing and exciting time in a teenager's life as well. This is a fun story to read and one that delves into a choices, family relationships and sweet, young love. "A Road Unknown," book 1 in Barbara Cameron's Amish Roads series, is a great start to a series that I am looking forward to reading more of! Elizabeth is given two choices and she thinks she has made the right choice, but then in the midst of her new life she wonders what really is the right choice for her? Elizabeth is a character whom can be related to and be empathized with. How many times are we faced with having to decide what road to take and even after deciding which one, we are still filled with uncertainty and wondering what could have been? Elizabeth has felt like she hasn't had time to really live life and have a life of her own, but once she is living the life it's not as she expected it to be. The story will keep you hooked as Elizabeth has two men fighting for her affection and she is torn between two communities. This is a good story that will keep you turning pages and completely immersed in the characters' lives. To read other reviews included on this blog book tour, go here! 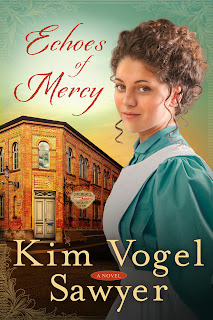 Undercover at a chocolate factory - get ready for sweet romance and secrets in "Echoes of Mercy"
"Echoes of Mercy" is the latest novel from Kim Vogel Sawyer and this is a delicious mix of suspense and romance! Caroline and Oliver are both working undercover at Dinsmore's World -Famous Chocolates Factory, but they are both there for different reasons and they do not know each other's true identities or motives. However, these two become friends, but there are so many secrets between them as well as issues that they disagree upon which causes tension between these two. I really enjoyed "Echoes of Mercy!" I loved the setting and the inside look into the world of making chocolates, from all aspects, being that of the owner and of the common worker. I loved both Oliver and Caroline as main characters. Each are strong, and independent and able to think for themselves even amongst influence from others. Caroline's past has formed her into whom she has become as an adult and helped drive her in her work which makes her an inspiring character as well. I highly recommend this book for those whom enjoy historical fiction sprinkled with romance and mystery. Enter Today | 2/17 - 3/8! About the book: Tess has taken some ribbing from her fellow officer, Logan, for her quilting hobby. He finds it hard to align the brisk professional officer he patrols with during the day with the one who quilts in her off-time. Besides, he's been trying to get to know her better and he'd like to be seeing her during those couple nights a week she spends with her quilting guild. I have really enjoyed the books that I have read in the Quilts of Love series and "Scraps of Evidence" by Barbara Cameron, may just be my favorite one in the series so far! The story begins with Tess, a police detective, being assigned a new partner at work and as she is adjusting to her new professional life, she is also adjusting to some changes in her personal life as well. Tess is very close with her Aunt Kathy and they share a love of quilting; however these quilts may also hold the key to solving a crime, but may also be placing Tess in danger. I loved this story, but there is one important thing to note, the back cover of this book does not match up with the story. I was confused at first because I always read the back cover before beginning a book and when I started to read I was confused as Tess' aunt's name is Kathy, not Susan. However, don't let this bother you and just enjoy the story, believe me you will not be disappointed! I love how in the very first chapter there is a lot going on - Tess is assigned a new partner, Aunt Kathy is in the hospital, tension in Kathy and her husband's relationship is alluded to and Tess shares with her new partner why she got into law enforcement; all of these caught my attention and I just wanted to keep on reading! This is a quick read and one that I really enjoyed! I am looking forward to reading many more in this series, as I love the role that the quilts play in each of this stories. Enter Today - 2/4 - 2/22! About the author: John Faubion has spent many years in Asia as a missionary with his family. Since returning to the United States, John has worked as a senior software developer for a large appliance chain. He teaches an adult Sunday school class and enjoys writing and driving his 1949 Packard automobile. John lives near Indianapolis with his wife, Beth, and their daughter. John Faubion's debut novel is suspenseful, current and will keep you on the edge of your seat reading! "Friend Me" is an all too realistic look into today's society: lonely people wanting a friend, wanting comfort, turning to the internet to fulfill that need and not being aware of the dangers that go along with this. Scott and Rachel could be the couple living next door, the couple whom is overwhelmed with responsibilities, feeling pressure at work, not feeling confident about themselves and turn to a virtual friend to meet the needs of feeling secure, and feeling listened to without being judged. Melissa has issues from her past that have not been addressed and she is seeking to fulfill needs in her life, no matter how it impacts others. I found myself drawn into Scott and Rachel's world and empathizing with them, with Scott's insecurities at work, Rachel's insecurities about her appearance and feeling overwhelmed and underappreciated. I also found myself cringing and yelling at them to be careful and not do something during their moments of contact with Melissa, contact with someone whom they really do not know. I highly recommend this book for anyone who enjoys a suspenseful read, this is a fast-moving and intense story that you will not want to miss out on! To read other reviews that are included on this book blog tour go here! Shelley Shepard Gray is back with a new series! "Hopeful" is book 1 in her Return To Sugarcreek series and I really enjoyed it and I feel as if it is a perfect start to the series! Miriam is a perfectly imperfect character and one whom is completely relatable to. The book begins with Miriam running late to work and the story takes off from there and immersing the reader into Miriam's world. Miriam is insecure about her physical appearance and has had her heart set on a man whom is only interested in Miriam in order to get the attention of her friend. "Hopeful" is a sweet romance that will sweep you away into an Amish community and leave you feel as if you have a new group of friends. To read other reviews included on the book blog tour go here! Enter Today | 2/11 - 3/1! As the bizarre break-ins continue and Heather pursues the elusive "Summer Santa," Andy and Rip discover an enormous and well-kept garden of wildflowers that seems to have grown overnight at an abandoned steel mill. Meet the author: Over the course of his life, William Sirls has experienced both great highs and tremendous lows---some born of chance, some born of choice. Life lessons involving faith, grace, and forgiveness are evident in his writing. The Sinners' Garden is his second novel. His first novel, The Reason, was published in 2012. William makes his home in southern Michigan. William Sirls' latest novel, "The Sinners' Garden," will draw the reader in and hold you there in the story for long after the book is finished. This community is filled with people whom are hurting, hiding behind their pasts, struggling to move forward in their lives and seeking healing. I loved the characters and hope to read further books about some of them, mainly Andy. Rip and Heather I both enjoyed reading about as well. While reading, I felt as if I were a part of the characters' lives and immersed in the community. This is a beautiful, well-written book that brings God's healing and love to life for each of us. "Love's Sweet Beginning," book 3 of Ann Shorey's Sisters at Heart series, is the much-anticipated story of Cassie. Cassie never had to learn to care for herself or learn skills to make her way in the world as she was always taken care of by others. However, the war changed all that and Cassie is forced to find work. Cassie returns to Noble Springs excited to be back to this town where she met Faith and Rosemary. There are a few others she is excited to see and one in particular whom could be the answer to her problems and also one to capture her heart. I have been waiting for Cassie's story as she was introduced in the previous books in this series and it was very well-written. First of all, I love the cover, it is beautiful and fits in so perfectly with the other two book covers in this series. Ann does such a great job with bringing these characters to life and also the time period, the struggles of rebuilding and starting over after the war. The romance woven throughout is sweet and I loved reading about Jacob and Cassie's story and watching their relationship grow. I am excited to see what Ann writes next! Bruce Feiler’s “The Secrets of Happy Families” Kindle HDX Giveaway! Bruce Feiler's "The Secrets of Happy Families: improve your mornings, tell your family history, fight smarter, go out and play, and much more" is a must-read for every parent! This is a book that will change your interactions with your children and the entire family unit as a whole. There are three main sections of the book with well-defined chapters, so it is easy for the reader to jump around to the parts that are identified as high priority if one does not have the time to sit down and read straight through. However, the entire book is most definitely worth reading! I love the section on family dinners as this is such an important time for families and such a wonderful opportunity to discuss things and reflect upon the day and just a great time for a family to connect. There are chapters devoted to connecting as a couple, conversations with children and playing as a family. Also, the toolkit included in the end is a great addition to the book. I really enjoyed this book and one that I will refer to often. What better way to spend this snowy Valentine's Day than curling up with a good book or baking? Okay, well maybe there are more romantic plans out there for the day, but seriously if reading is on your agenda for today, then "Sweet Nothings," by Janis Thomas, is just the book to read (and has the baking part too without you actually doing any!)! This is a fun, light read that is filled with romance, romantic struggles, sweet treats and an overall delicious story! Keep on reading to read a cute excerpt from Janis and a description of the book. Happy Valentine's Day and enjoy this sweet day! 10. Extreme heat makes cake smell good.9. There is such a thing as a perfect cake. Smitten Book Club Kindle HDX giveaway, Facebook Party, and Book Brunch! About the book: The century-old Gentlewoman's Guide to Love and Courtship is no ordinary book club choice. But for the little book club in Smitten, Vermont, it might be their best pick yet! "Smitten Book Club" is the third Smitten book written by these four authors and this was my favorite of the three! The old leather bound book of "The Gentlewoman's Guide to Love and Courtship" was chosen as the book selection for the group's book club and it is one that the ladies will enjoy and interpret in different ways. Heather, Molly, Lia and Abby all have a novella devoted to each of them in this collection and their interpretation of the book is shared as for these ladies this book is filled with tips, mystery and most of all a guide for finding love. Each of the four novellas are enjoyable to read and a sweet love story that is just wonderful to snuggle in and read on these cold, wintery days. I love the quotes that are shared at the beginning of each chapter as these really adds so much and really makes the reader get into the book club choice as well! Now I want to go out and find my own "treasure" book to read in a book club! If you want to read other reviews of this book, go here!